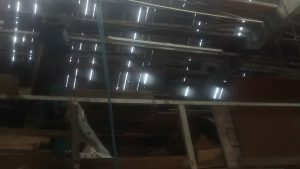 The North East Maritime Trust [NEMT] has just agreed a lease on what is believed to be the last remaining traditional boatyard along the entire NE coast between Amble and Whitby. The yard in South Shields had been run by boat builder Fred Crowell for over 25 years and has been leased by NEMT following his retirement. The yard has a slipway into the Tyne, allowing boats to be winched out of the river for maintenance and repair. This has been a facility not available to the trust until now and gives us the opportunity to increase our capacity to maintain wooden boats and offer the traditional boat building skills to people interested in learning them. The yard is a relic of a bygone era, when many yards of its kind could be found on the riverbanks of the region. In an era when wooden boats were common, these yards were the life-blood of the river, where the traditional skills needed to keep boats afloat were preserved. After many years of neglect, however, the building is now in a poor state of repair. 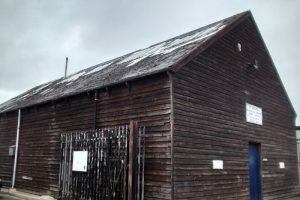 North East Maritime Trust is launching an appeal to raise £28,000 for a new roof and other changes, part of which they hope will be raised by community donations. We are hoping to have this repaired as a matter of urgency to prevent further deterioration.